Back in 1994, the O.J. Simpson Ford Bronco chase down the L.A. Freeway was one of those events that most Americans remember being transfixed by as we as a people had not yet ushered in the era of 24 hour news cycle or the weighing in of our every opinion through social media tools like Twitter and Facebook. Instead, most of us around at that time remember watching our TV for hours as O.J. Simpson, the celebrated football star who made the transition from sports icon to celebrity with a fairly decent movie career, was on the run in the backseat of his white Ford Bronco driven by his friend A.C. Cowlings proclaiming he did not kill his wife Nicole or her friend Ron Johnson. What in the world, we wondered? This was an episode that defined the 90s for most of us, and the trial that followed was even more of an event unlike anything we had ever experienced. Everybody watched the nonstop coverage of the trial, and the resulting verdict sparked riots and heated conversations for years to follow. Having lived through all of it as a young adult, I thought I know most of what happened, so when the miniseries by Ryan Murphy was first announced, I couldn’t help but think if a dramatization of the trial was really necessary. Even my teenage children know most of what happened with the trial, but with a true life story like this one, it was very easy to get sucked right in to the series. The series, like our memories of the whole O.J. affair, starts at the beginning where the bodies of Nicole Simpson, ex-wife of superstar athlete/celebrity O.J. Simpson, and her friend Ron Goldman, are discovered outside of her house in Brentwood with multiple stab wounds. The grotesque scene is only the beginning of a shocking chain of events as the police investigation immediately links O.J. himself as the prime suspect in the murders. What results over the epiosdes of the miniseries is a recounting of O.J.s fleeing in his white Ford Bronco as described earlier, his subsequent arrest for the murders, and the trial of the century. But what makes this whole thing better than just a TV movie of the week re-hash of major events is the angle through which this series recounts the events, and the acting of most of the principal actors in the series. Sarah Paulson, familiar to any fan of Ryan Murphy TV series, plays the memorable lead prosecutor in the case, Marcia Clarke. Marcia Clarke, in my opinion, received way too much attention during the actual trial for her hair than for the fact she was a good attorney given a case that should have been a slam dunk, but instead turned into a much bigger reflection of our society as a whole in the 90s and really highlights how flawed our justice system has always been (and unfortunately remains today). Those with money, regardless of the color of your skin, can buy most of what they want in this country, and what O.J. is able to buy is the dream team of Robert Shapiro (John Travolta sporting some seriously good makeup effects), F. Lee Bailey (Nathan Lane), and Johnny Cochrane (Courtney B. Vance). The four actors are very strong in their roles, but Paulson and Vance really elevate the whole series as they do not play their parts as charactures. They embody their characters, and present the people as they are- flaws and all. It’s a good thing the focus of the series rest mainly with their characters as Cuba Gooding. Jr,, Oscar award winning actor for Jerry Maguire, is a weak link in the series. O.J. Simpson is one of those people who most people instantly recognize because despite what you believe did or did not happen, was a very good-looking guy with a charming persona. Cuba Gooding, Jr. just does not ever master that O.J. quality- instead, all I could hear was his scratchy vocal quality and it felt as though he didn’t know which way to go with the O.J. character. Play him as a guy who truly believes in his innocence, or portray him as someone hiding a big secret and trying to convince himself that what he did was acceptable because of who he thinks he is? His performance just never really gelled, which is a shame, because as an actor, I think Cuba Gooding, Jr is usually very good. He just is not O.J.. However, there is so much good happening in this dramatization, that poor casting for the main character is easy to forgive. Ross (I mean David Schwimmer) shows up as Robert Kardashian, O.J.s loyal friend wo also happens to be a lawyer and even more of a big deal now as he is the patriarch of the Kardashian clan. He does a nice job of playing the always worried about O.J. Kardashian, and the fact that it is suggested he doubts O.J.s innocence as time goes by is overshadowed by the revelation that O.J. threatened suicide in Kimmy’s room (yes, Kim Kardashian- I’m told relentlessly through the media coverage of the Kardashians that that is a big deal). Other equally good actors show up in other roles in the series such as Connie Britton as Faye Resnick and Bruce Greenwood as L.A. District Attorney Gil Garcetti, but again, it is the actors playing the lawyers that really steal the show. I would be remiss if I did not also include Sterling K. Brown’s performance as Christopher Darden, the lawyer who worked with Marcia Clarke who sabotaged the prosecution’s case by having O.J. put on the bloody glove found at the scene of the crime. Brown’s performance makes Darden’s plight, an African-American lawyer in the DA’s office brought in more because he could hopefully balance out the prosecution’s case more because of his skin color than because of the fact that he was a capable lawyer, very sympathetic and easily one of the more touching storylines in the series. Overall, this miniseries is one of the most entertaining ones I have seen in a while. It does not reinvent the genre, and much of what it does is a simple recounting of the events with some new info thrown in to keep it fairly fresh without messing with our own first hand experiences of the events. What it does well, is gather a strong cast to show the events which highlight a bigger scope than just the trail itself. It puts a mirror up to our legal system and our society as a whole and asks us have we come as far as we think we have? If you are not sure, watch, or re-watch as I have, Netflix’s Making A Murderer. These two series back-to-back show that in the grand scheme of things, money has more power than just about anything else. If you are white and poor, you are most likely not going to get the trial you deserve like in MAM, but of you have enough money, like in The People vs. O.J. Simpson, you can often buy the best defense team out there to erase facts and DNA regardless of what your skin color is. The series does not preach its opinions one way or the other, it just gives us an entertaining recounting of what happened and illustrates what it was like at the time to let us take from it what we will. American Crime Story: The People V. O.J. 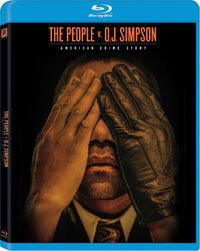 Simpson does fit on Blu-ray Disc courtesy of 20th Century Fox Home Entertainment. The three-disc set contains all 10 episodes of the series. The show has been letterboxed at 1.78:1 and the Disc contains an AVC 1080p HD transfer which runs at an average of 30 Mbps. The image is very sharp and clear, showing on notable grain or defects from the source materials. The colors look very good and the image is never overly dark or bright. The level of detail is good and the picture has a nice amount of depth. Essentially, this rivals HD broadcast quality. The Disc carries a DTS-HD MA 5.1 track which runs at 48 kHz and an average of 3.7 Mbps. The track provides clear dialogue and sound effects. Being a dialogue-driven drama, we don't get an abundance of impressive effects here, but the mix is always sure to put crowd noises in the rear channels and emphasize the fact that choppers are circling overhead. The two extra features with American Crime Story: The People V. O.J. Simpson are found on Disc 3. "Past Imperfect: The Trial of the Century" (29 minutes) is a making-of featurette which contains comments from those involved in the making of the series, including Jeffery Toobin, who wrote the book which serves as the source material for the show. The piece starts with a discussion of how the prO.J.ect came together and then moves into an exploration of the characters. Here, we hear from the cast members who describe how they approached the material. The featurette then looks at the production of the show and how history was re-created. "Facts of the Case: An Interactive Timeline" is a four-part extra feature which combines text and video from the series to bring a detailed, step-by-step look at how everything happened.